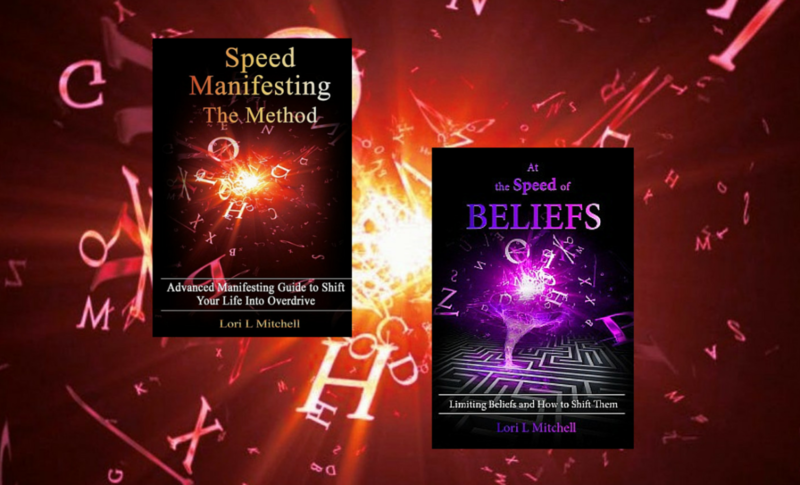 Home »"SPEED Manifesting"»How Could I Manifest a Red Butterfly When There is No Such Thing? I was sitting in the car outside the speaking venue on Friday morning, waiting for the host. I made sure I had plenty of time to get to the breakfast event, since I was the speaker and lived an hour away. Just before leaving earlier that morning I had decided to demonstrate manifesting so I could show the audience fast results. I decided on manifesting something unique. I chose a “red butterfly” even though as far as I knew, there is no such thing in nature. I wrote it down and sealed it in an envelope to prove it was magical and packed up the car. However, it was not meant to be revealed that morning. The host arrived and I got busy unpacking and meeting people. I had a great time and connected with a lovely audience. I even stayed for a cappuccino with the group and answered many questions. Then I got back into my car and saw — the sealed envelope sitting on the floor of the back seat! I had completely forgotten about my fun demonstration, and no red butterfly had shown up to remind me anyway. I felt a tinge of disappointment, and also relief that I didn’t make a fool of myself by having a public disappointment. My internal talk invited in doubt and self-judgement, like I was some sort of fraud because I wouldn’t have been able to fulfill on my showy manifesting. The next day, on Saturday morning my teenage son asked me to drive him to the Oasis shopping mall near the beach. It was unusual for him to ask for this location since we have several other larger indoor malls he would normally choose. As we got into the car I noticed the envelope still sitting there on the floor, reminding me of my arrogance and flaws. We got near the beach and as we waited at a nearby traffic light, I looked up toward the highrise at the Oasis, and nearly forgot where I was and what I was doing. 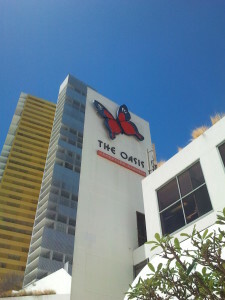 I looked at the logo on the building that I had visited for over 4 years living on the Gold Coast, and UNbelievably — there was the Red Butterfly! It had been there all along. I had probably noticed that it was a butterfly, but more importantly, I had never noticed that it was RED! I had to have a witness to this, so I told my son what happened, and as I dropped him off I tore open the sealed envelope and showed him my little handwritten piece of paper with “Red Butterfly” as proof. As I pondered the manifestation on the way home, I wondered why I felt I needed to prove something to others? What could I release out of these circumstances and negative feelings? A need to please? Some arrogance? This wasn’t my mind’s doing – I didn’t subconsciously or consciously create the opportunity; – I hadn’t decided to take my son there. He asked me spontaneously, and I happily and willingly went along with his request (which ultimately allowed me to notice and receive my intention). Yes, my subconscious would have filed that image away and tuned me into it as we arrived, but a super-conscious connection (Life) created the circumstances for me to receive my intentional experience. Out of this experience I got a greater humility, rather than a greater arrogance about manifesting. This was back in 2009, and I don’t play that game any more for the sake of public demonstration. I do play it in private, and encourage you to practice manifesting and play, too. You may find that you can let go of some negative beliefs about yourself and Life. You may discover a new level of positive beliefs (faith) that gives you even more power to your humble connection with your creative source. Or you may just have more fun.